According to William Curtis, neither Postmodernism nor Brutalism can be easily characterized as a style, although each term is capable of designating a group of aspirations and rejections, however vague they may be. Yet in fact is not difficult to detect the formal, constructive and even symbolic characteristics shared by Brutalist works, which can be easily extracted from the wide range of works to which the term has been applied. What seems to slip through one’s fingers is a way to grasp, among so many and such diverse productions, something more than their similarities, more than a certain tactile sensibility. 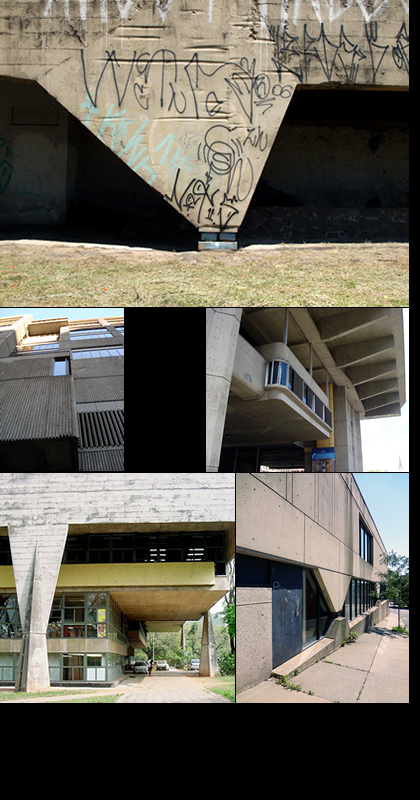 As Curtis states, the only thing which really links Brutalist architectures is captured in a ‘cliché’; namely “the bare concrete surface, procured with the aid of rough wooden formwork” (Curtis, 1996:550; 602). Yet, this too is insufficient to grasp Brutalism as a trend, let alone a style. In any case, the term Brutalism seems inappropriate because it lacks any essential quality or substance capable of linking beyond any doubt the majority of its manifestations. Such an essential quality might perhaps be ethics; or at least a moral standard applied to architectural design. However, this would not be an architectural definition, but a subterfuge, escaping from the vagueness of one domain – architecture – to the even greater vagueness of another – the ethical-moral dominion – leaving architecture to philosophy without solving the problem of the definition of the term. Instead of discarding Brutalism as an inappropriate, conceptually vague term, we might find, paradoxically, that it is suitable, once we adopt a pragmatic or phenomenological approach. All one has to do is to renounce the search for an internal, essential harmony between Brutalist works; and instead accept that what really unites them is their appearance. By accepting this putative superficial definition and ceasing to look for an essential one we can, without logical inconsistency, bestow the title “Brutalism” on a wide range of correctly dated works, sharing similar formal and surface characteristics; even tough each one of them and / or their creators hold different conceptual, ethical and moral attitudes. In other words, some buildings can be called Brutalist simply because they appear to be so; since what determines their inclusion in the group is not their inner essence but their surfaces; not their intrinsic characteristics, but their extrinsic manifestations.